It has been six years since Caro Wozniacki was atop the end-of-the-year WTA rankings. Back in those years (some of her best), she reached many finals. But, especially in the Grand Slams, she grew crazy nervous and the steady foe almost collapsed. But not this time. No, she rose super high. In 2014, Wozniacki reached the US Open final, when she was ready to win her first major. She went on court against Serena Williams — her good friend — and clearly, the American is a better player. Why? Wozniacki did not hit the ball harder enough, and she lost in straight sets. No big deal. But pretty quickly, it became a huge deal. In 2015, she would push the ball frequently, and she would not go for the lines. She only won one small title. Wozniacki was freustrated and disappointed. In 2016, she did the same thing, more or less. Her backhand is one of the best shots out there, and she is incredibly fast. She never gets tired — ever. But her forehand was pretty weak, she would rush the net much, and she did not attack on the second serves. 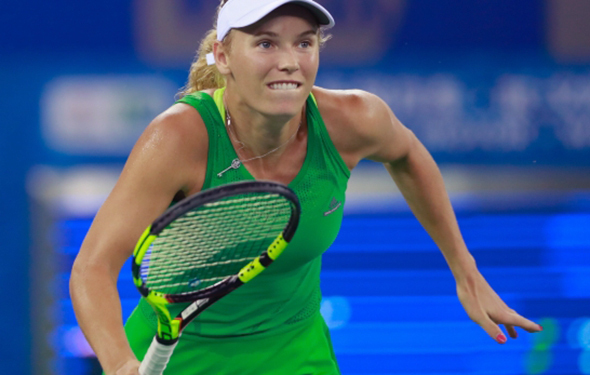 Wozniacki did manage to win Tokyo and Hong Kong, but it wasn’t big enough for a player of her ability. This season, finally, she changed and she became more aggressive — especially with her forehand — and courageous. That got her to six finals and six failures in Doha, Dubai, Miami, Eastbourne, Bastad and Toronto. Could she find a way to do something different? At the US Open, in early September, she froze again. She then went to Asia, and she discovered that win or lose, she has to burst out of her shell and take some chances. Wozniacki won Tokyo and when she arrived in Singapore for the WTA Finals, she felt more comfortable with her new strategy. She crushed the No. 1 Simona Halep, edged Karolina Pliskvova in the semis, and in the final, she jumped over the seven-time Grand Slam champion Venus Williams 6-4, 6-4. Wozniacki won it, and on court, she smiled, so wide. Wozniacki jumps up three slots and finishes 2017 ranked No. 3. She has already been No. 1 for a couple of years, which is good in a way, but the most important thing is to finally win a Grand Slam. Next year, in 2018, she has to step up and play ball. If she does, she can win her biggest trophy. The 26-year-old has been playing at the WTA for 10 years. It is time for her to triumph. Next year, we will discover that inside of her head, she will understand exactly what she has to do. “I’m really proud of how I have played all week and how I have fought and how I really produced some great fighting out there. To be here with the trophy means a lot, and it’s a great way to finish off the year,” she said. Roger Federer may not be surprising us with his greatness, but he keeps on proving that the best is just a word that is constantly being redefined. Federer won his hometown tournament in Basel for the eighth time, downing Juan del Potro and, in a certain sense, getting some revenge over the player who knocked him out of the US Open. More importantly, Fed moves into second place alltime with ATP wins. He eclipsed Ivan Lendl as he grabbed his 95 title along with his seventh this year. In an era with less money and more incentive to play often, Jimmy Connors won 109 tournaments over his long career. In the era when competition included undeniable greats Rafael Nadal and Novak Djokovic, Federer keeps finding a way to cement his legacy as the GOAT. Federer is probably waving goodbye to any chance at ending the year as No. 1 by pulling out of Paris. Without emassing some major points in the French capitol, even a tournament win in the ATP Finals won’t allow Federer to surplant Nadal as yearend No. 1.